I had the privilege of meeting Semie Moseley several times before he died. I never did get to know him very well so I feel unqualified to write about him. One of my customers sent me this article written by Robert Price. When I read it I thought that my readers might enjoy this so I am reprinting it here. Semie's daughter Dana worked here for quite some time in 2008 building guitars not just Mosrites. There might have been a little bit of Glen Campbell in Semie Moseley - maybe just a dash of Elvis, too. At nearly 6-foot 4 and 200 pounds, with thick, dark hair, a movie-star smile, near-virtuoso proficiency on the guitar and a warm, appealing baritone voice, he might have been a hit-maker himself. But Moseley was infatuated - no, obsessed - with guitars. He couldn’t find one that felt or sounded quite like he wanted, so, while still a teen-ager, he started building them himself. And build guitars he did - perhaps 50,000 of them, most constructed in a warehouse just across the tracks from the Bakersfield Convention Center. At the peak of production in 1968, Semie, his brother Andy and their crew of 107 employees were cranking out 1,000 Mosrite guitars per month - acoustics, standard electrics, double-necks, triple-necks, basses, dobros, even mandolins. Glenn Campbell played one. So did Barbara Mandrell, Little Jimmy Dickens, Tommy Duncan and Ronnie Sessions. Joe “King of the Strings” Maphis played a gaudy, 1954-vintage custom-built double-neck Mosrite. 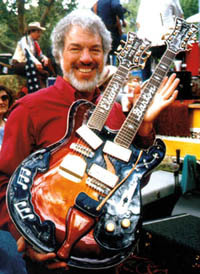 Don Rich, the Buckaroo mainstay who built his reputation on the Fender Telecaster, bought the first Mosrite to ever come off the assembly line - Serial No. 001. The Lemon Pipers, one-hit rock-chart wonders with 1968’s No. 1 “Green Tambourine,” borrowed The Who’s adolescent-rage schtick and smashed their Mosrites on stage after concerts. And later on, punk rockers like the Ramones and B-52s adopted the guitar for hits like “I Wanna Be Sedated” and “Rock Lobster,” respectively. 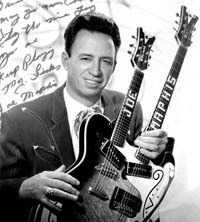 But the client who turned Mosrite into a household name, at least among guitar enthusiasts, was Nokie Edwards, lead guitarist for the kings of ‘60s surf-rock, the Ventures. Edwards fell in love with the guitar, and by 1962, the entire Seattle-based band was playing Mosrites on songs like “Walk, Don’t Run” and the theme from “Hawaii 5-0.” The band, having signed a special distribution agreement with Mosrite, featured the guitar on its album covers. The Ventures were Godzilla huge in Japan, and orders for the Ventures model Mosrite (suggested retail price: $462, steep for the mid-’60s) poured in from the Far East, the South Pacific, and all over the world. Then, in a period of a few months, it all collapsed. Mosrite’s distribution arrangement with the Ventures came to an end after five years, and a new, much-ballyhooed deal with the Thomas Organ Co., maker of the Vox guitar, proved disastrous. 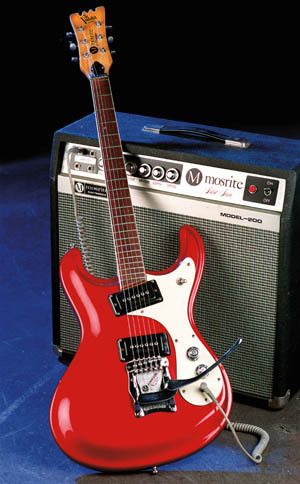 Mosrite filed for bankruptcy on Valentine’s Day 1969, and things were never the same. But for a while, Semie had the full attention of the music industry. Semie Moseley was born in Durant, Okla., in 1935; his brother Andy was two years before. The family followed a migratory path similar to many Bakersfield Okies, landing first in Chandler, Ariz., in 1938, and two years later in Bakersfield. Semie’s mother worked in a dry cleaner’s shop, his father with the Southern Pacific Railroad. The brothers experimented with guitars from their teen-age years, refinishing instruments and building new necks. In 1954 Semie built a triple-neck guitar in his garage (the longest neck was a standard guitar, the second-longest neck an octave higher, and the shortest neck an eight-string mandolin). Later that year he presented a double-neck to Maphis, a Los Angeles-area TV performer who played often in Bakersfield. By 1956, with investment dollars from the Rev. Ray Boatright, an L.A.-area minister, the brothers started Mosrite of California. When Semie, who built guitars for L.A.-based Rickenbacker, proudly told co-workers he was making his own product, he was fired. It was sink or swim now. Then Moles met Edwards in a club in Tacoma, Wash. Moles had gone to the Pacific Northwest in 1961 to play in Dusty Rhodes’ band, and he was late to work one night at the Britannica, having been engaged in moving his family north from Bakersfield. 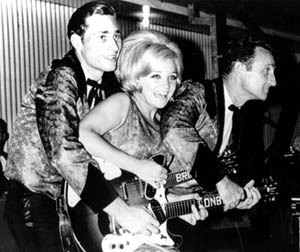 Rhodes had drafted Edwards to fill in on guitar. Sales of the Bakersfield-built guitar (Hallmark, Standell and Gruggett guitars were also manufactured in the area) gained steadily over the next five years, and Semie became a rich man. He maintained his staunch religious convictions, however - he was raised in a Pentecostal family - and he managed to continue touring the country, playing gospel music in churches of all denominations. At one point he also auditioned for a job as a movie stand-in for Elvis Presley, and he was accepted. But by the time the studio asked him to sign on, he had learned enough about the role and the movie industry in general to have been soured on it all. Citing religious reasons, he begged out. Business opportunities came and went. Sears & Roebuck Co. anted up millions of dollars in a buy-out offer, but Moseley turned it down. He purchased the company that manufactured dobros, and, according to Moles, “we had dobros coming out of our ears.” Still, Moseley expanded his line: the Ventures model; the Celebrity 1, 2 and 3 acoustic models; a larger, thick larger, thick gospel-acoustic model (Semie gave away dozens to churches across the country); the Serenade acoustic; and the electric Californian, which had a Mosrite neck and a Dobro body. He and Andy also branched off into recording with Mosrite Records. Irby Mandrell, an Oceanside music-store owner who sold Mosrites, saw to it that his talented teen-age daughter, Barbara, was signed to the label. After things got rolling, Andy focused on the record label and Semie stayed with his first love, the guitar company. It all came to pieces in late 1968. Andy, who today runs a Nashville recording studio with his son, Mike, wonders if it was a good idea to sign an exclusive distribution contract for up to three years with a company that manufactured a guitar of its own - a competitor. “Their inability to market the guitar, or whatever, caused our demise,” Andy said. Was it a conspiracy, a premeditated act? Following the bankruptcy, the Moseley's tried to deal directly with stores, and they sold 280 guitars in 1969 before they came to the shop one day and found locks on their doors. Two years after his bankruptcy, Semie was able to get back the Mosrite name, and in 1970 he started making guitars again in Pumpkin Center. He moved his factory three times in the next 20 years: To Oklahoma City, Okla., in the mid-’70s, to Jonas Ridge, N.C., in 1981, and to Booneville, Ark., in 1991. Six months after moving to Arkansas he became ill with bone cancer. Just six weeks later, in August 1992, he died.